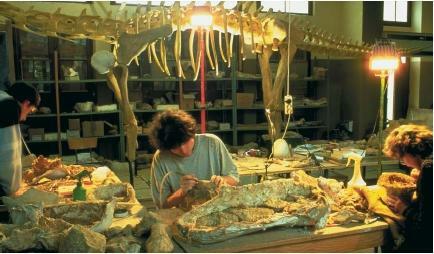 Paleontology is the study of ancient life-forms of past geologic periods. Paleontologists learn about ancient animals and plants mainly through the study of fossils. These may be the actual remains of the animal or plant or simply traces the organism left behind (tracks, burrows, or imprints left in fine sediments). Paleozoology is the subdiscipline of paleontology that focuses on the study of ancient animal life. Paleobotany is the subdiscipline that focuses on the study of the plant life of the geologic past. Geologic time is a scale geologists have devised to divide Earth's 4.5-billion-year history into units of time. A unit is defined by the fossils or rock types found in it that makes it different from other units. The largest units are called eras. Periods are blocks of time within eras, while epochs are blocks of time within periods. Scientists believe the earliest life-forms (primitive bacteria and algae) appeared on Earth some four billion years ago, at the beginning of the Precambrian era. Over time, these simple one-celled microorganisms evolved into soft-bodied animals and plants. To be preserved as a fossil, an animal must have a hard shell or bony structure. For this reason, there are no fossils older than about 600 million years, which marks the beginning of the Paleozoic era. Paleontologists label the beginning of the Paleozoic era as the Age of Invertebrates. Invertebrates are animals that lack a backbone (a spinal column encased in vertebrae). The first period of the Paleozoic era, the Cambrian period, saw an explosion of invertebrate evolution, giving rise to every group of invertebrates that have existed on Earth. The main or dominant invertebrates during the Cambrian period were trilobytes—flat, oval marine animals. All animals during the Cambrian period, which lasted until about 500 million years ago, lived in the oceans. Extinction: Condition in which all members of a group of organisms cease to exist. Fossil: Remains of an ancient animal or plant, usually preserved in sedimentary rock. Geologic time: Period of time covering the formation and development of Earth. Invertebrate: Animal that lacks a backbone. Vertebrate: Animal with a backbone. The fourth period of the Paleozoic era, lasting from 405 to 345 million years ago, is known as the Devonian period. This period saw the rise of fishes as the dominant life-form, and therefore marks the beginning of the Age of Fishes. The first vertebrates (animals with a backbone) were fishes, although these early fishes lacked jaws. The Devonian period also saw the rise of the earliest plants (such as ferns and mosses), insects, and amphibians (the first vertebrates to leave the oceans for dry land). Reptiles—cold-blooded, air-breathing vertebrates that lay eggs—first evolved from amphibians about 320 million years ago during the Carboniferous period (fifth period of the Paleozoic era). They became the dominant species on land, however, during the Permian period, the last period of the Paleozoic era. Hence, this period marks the beginning of what is known as the Age of Reptiles. Lasting from about 280 to 250 years ago, the Permian period also saw the mass extinction of over 90 percent of marine species. Reptiles continued to dominate the planet during the next era, the Mesozoic era, which lasted from about 250 to 65 million years ago. 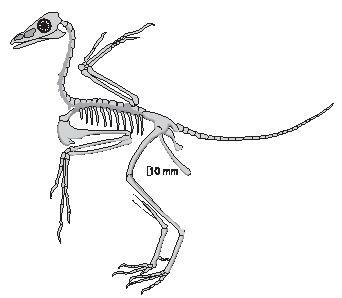 This era also saw the rise of the earliest flying reptiles and birds, conifers (conebearing) and deciduous trees, and flowering plants and grasses. However, this era is most prominently marked by the evolution of smaller reptiles into the dinosaurs, who appeared about 225 million years ago during the Triassic period (first period of the Mesozoic era). Dinosaurs roamed and governed the world for about 160 million years before they were wiped out in a mass extinction 65 million years ago. Scientists believe a huge asteroid struck Earth off the northern tip of the Yucatan Peninsula of Mexico. The resulting inferno from the impact killed hundreds of thousands of species and brought an end to the reign of the dinosaurs. The Cenozoic era, the last 65 million years of Earth's history, has seen the rise of warm-blooded mammals as the dominant form of life. Although the first land mammals were not as large as dinosaurs, they were much larger than present-day mammals. Around one million years ago, during the Pleistocene epoch of the Quaternary period, ancestors of modern humans became dominant, with many species of mammals becoming extinct in the process. Hi! I've read your article and it actually help to understand better about evolution and more importantly about Fossil Reptiles . I'm in grade 12 and I'm taking Biology and we're learning about evolution , fossils and palentology . Our teacher gave us an assignment that is worth a good portion of my grade going into the universities . The assignment is to build a figure out of all the different types of bonees that he gave us on a bristol by cutting it out and connect the bone parts together . Me and my partner built it , and it seemed to look like some sort of a reptile , or dinosaur or maybe an animal . By this Tuesday our teacher wants us to explain about what we built and on how we know that certain parts of bones goes there or here . He would ask questions such as what our figure is doing ( physical activity) and why is it formed that way and what enivironmental event might have occured on it's time . I was wondering if you don't mind you can help me on how to analyze my figure prior to the questions that our teacher will ask us and also how can we explain about our figure within 2 minutes . I would appreciate it if can reply back by this Sunday at the latest . the articles mainly have the exact topic i have looking for and it contains all the knowlegdes about the home work that my ST gave..but actually a student like me needs a picture or image about the topic especially the science because images can make us understand the topic that have been discuss... thank you very much..